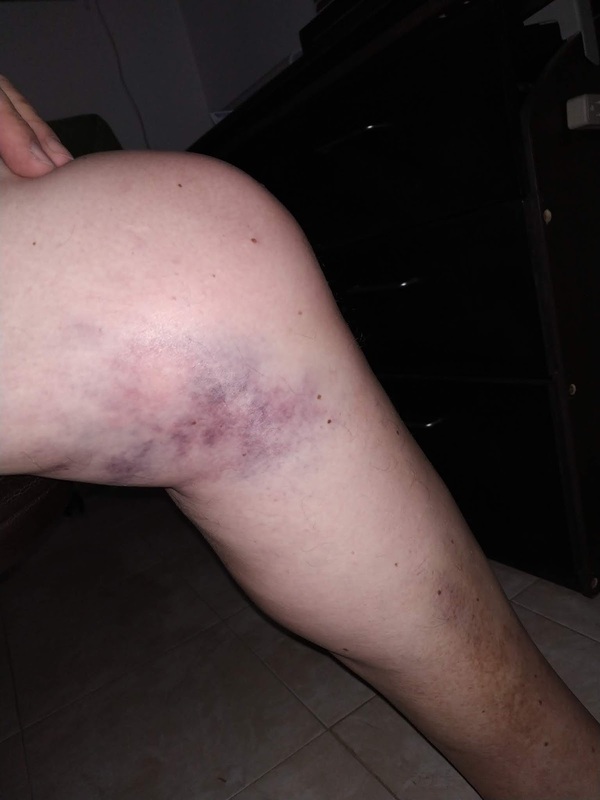 An Englishman in Colombia: Ouch! I had just entered this part of the road works, or should I say, non-roadworks, when a pick-up came round the corner coming uphill, so I had no option but to stay on the gravel section, keeping a light foot on the back brake, to keep the bike straight, however for whatever reason, it went from under us, and down we went, Marcela managed to throw herself clear, but my left leg was trapped under the bike, thank goodness, Marcela was with me, because there was no way I was going to lift it on my own. Two other bikes passed us, whilst we were on the floor, but no one stopped to offer help, which is par for the course over here, at best they will stop to gawp, but otherwise nothing. Fortunately the only damage to the bike was to the protection bar I had installed when I bought it, and one smashed mirror. I think I came of the worst in this incident. I haven't increased the size of this photo, I don't want to put you off your food! suffice it to say, badly bruised and swollen, but nothing broken. Once I was able to restart the bike, I took Marcela to work, then went to my friends in Copacabana, and bought some new mirrors, which although cheap, are actually better than the stock mirrors, in that they do not vibrate as much, so give a better view to the rear. I then went home, fitted the new mirrors, sanded down the damage on the protection bar and resprayed it, now just waiting for the next incident. During the day, Marcela rang the Dept. of Infrastructure at the Town Hall, who apologised, and said there had been a number of accidents at that location, and if we had incurred any cost, to send a formal letter, and they would 'consider' reimbursement. They tried to blame the Contractors for the hold-up in finishing the work, however everytime I passed, the men had jackets with Alcaldía de Copacabana on their backs, so I think as usual we are just being fed a load of BS. We still have no idea when it will be finished...if ever! At 2pm I collected Marcela from work, and we went to Medellin to collect the Nissan X-Trail, which Marcela tells me, drives like a new car, I just hope it stays that way, her Uncle told her, that if it drops back again...sell it! so we shall have to see, at least it passed it's 'revision tecnico'.